The briefcase as a fashion accessory often brings to mind of a man's bag. However the briefcase is one of the best carrier option if you have both documents and a light laptop to tote along with at your business meetings. Carried or clutched, it leaves with the female owner a modern style statement with a twist of classic reference. 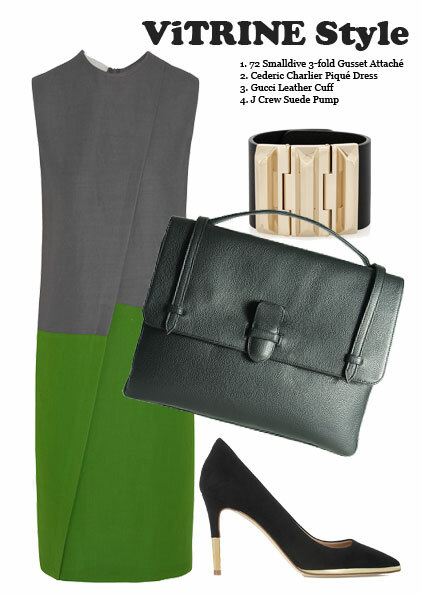 ViTRINE Style picks out an ensemble to show how 72 Smalldive Leather Briefcase could fit in with the modern womens wear without looking too severely masculine. The briefcase may be purchased online, and also ordered in a colour of your preference.